Rolwaling is a wild and little-frequented East - West valley located in the East of Nepal, just south of the Tibetan border. Our journey begins with a scenic drive on the Kathmandu - Lhasa highway to the ancient trading town of Dolakha. 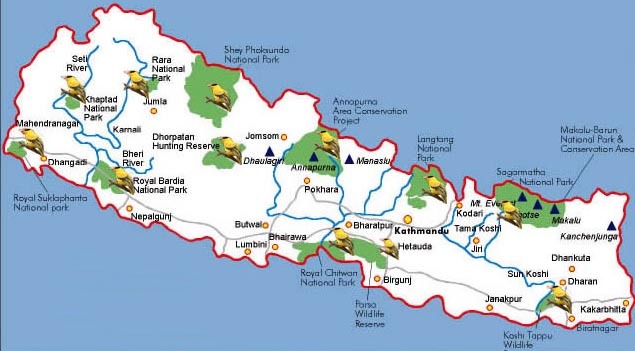 The trek leads through one of most remote and beautiful parts of Nepal, past picturesque Sherpa, Tamang and Chetri villages with their typical terraced fields, through dense, gloomy primeval forests and over broad ridge backed with wonderful views. It is a palpitating adventure over dizzy suspension bridges, impressive gorges and steep paths. We reach the Tashi Lapsa pass (5755 m), in the glaciated wilderness of the very heart of the Himalayas. The mountain scenery is stunning: Tengi Ragi Tau (6943 m), Bisphero Go Shar (6729 m), Dragkar Go (6793 m) and countless snowy peaks. After Tashi Lapsa we enter the Khumbu valley, land of the Sherpas. Day 03: Kathmandu - Dolakha (1650 m) by bus. Day 04: Dolakha - Shigati (1020 m). Our trek starts with a long descent to the river, through scattered villages and terraces. Afterwards, we head up; crossing may tributaries of the Thamba Khosi River. This is a pleasant walk as we gently gain height, following the course of the river. Day 05: Shigati - Gongar (1350 m). We carry on along the Bhote Koshi river north, along the bottom of its deep valley becoming gorge like. We crisscross the hectic river on picturesque suspension bridges and pass few hamlets and villages. The forest sometimes will give way to nice views of the Gaurishankar (7145 m). This area is still Hinduist although signs of Buddhism, with prayer flags and chortens, begin to mark the route. Day 06: Gongar - Simigaon (2020 m). Short stage. After a 2 hours-walk, we leave to valley to continue east. The path slowly gains altitude on an impressive landslide, and later goes across terraces. Simigaon is a Sherpa village, marked by its Tibetan monastery, perched above the houses on top of the hill. Day 07: Simigaon - Donga (2800 m). We now enter the Rolwaling valley. Through a gorgeous rhododendron forest, the path steadily climbs towards Gyalche. Eventually, we descend back down to the river and establish the campsite on the Rolwaling Khola bank, beside a few teahouses. Day 08: Donga - Beding (3690 m). We gradually climb the forested valley, with superb mountain scenery surrounding us. Arriving at Beding, we can glance at the Melungtse (7181 m), Rolwaling highest summit. Tibetan-like people who rarely see visitors inhabit this remote village. They will probably invite you to sample their chang (barley beer) or yak butter tea. Day 09: Beding - Na (4180 m). A short walk will take us to Na. A tiny alpine hamlet only inhabited during summer months. Na is situated in a beautiful valley overlooked by some very impressive peaks with Chobutse (6685 m) and Chugimago (6259 m). Day 10: Acclimatization day at Na. 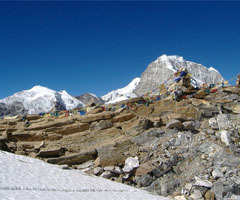 We can either take a rest or organize an excursion towards Yalung La pass. We climb a steady slope, taking us to a vast amphitheatre at 4900 m, situated just bellow the pass, and furrowed with streams. In every direction we get a stunning view: eastwards the Yalung Glacier, south the Ramdung Peak (5930 m), westwards the Yalung Ri (5630 m) and out north the summits of the Tibetan boarder. Day 11: Na - Nyiduk Kongma (4750 m). We climb up to the dam holding Tsho Rolpa. A Dutch team is actually in charge of the dam work, necessary to prevent the lake splitting the thin moraine and flow down the valley. We progress along the south bank. The ancient route, marked on all maps, following the northern bank and passing through Chobu, does no longer exist. In fact, the moraines boarding the lake have all collapsed into it. After a 300 m climb, we come across a chaotic moraine area and scramble down the same altitude. We establish our campsite in a sandy amphitheatre overhanging the boarder, in between the Tsho Rolpa and the Trakarding glacier. Glacier (5200 m).The path plunges towards Trakarding glacier. This is an impressive and vast rocky area that gives way, from time to time, to large sections of bluish ice. We struggle on towards a rocky spur, just beneath Dolumbau glacier. It is now quite a venture to access the glacier. We need to climb up a rock face and to set a rope for the porters, helping them to scramble up the 160 m before accessing the campsite area. This is a fantastic panorama with the Trakarding glacier below and the glacial great wall of the Drolumbau glacier north. An incredible spot, we are in an ideal position for the permanent spectacle of countless streams running down the glacier, falling rocks and collapsing seracs. Day 13: Drolumbau Glacier - Tashi Lapsa - Camp at 5200 m.
Day 14: Camp at 5200 m - Thame (3800 m). An easy and pleasant descent. Before getting to the tiny Sherpa village of Thame, we can visit its picturesque monastery perched at hillside. Day 15: Thame - Namche Bazaar (3440 m). This is a short and relaxing day. Many of the typical mani walls and prayer wheels are spread on the trail to Namche, the Sherpa capital. We have plenty of time to explore the bustling local market and admire the beautiful vistas of Thamserku (6608 m), Everest (8848 m) and Lhotse (8511 m). Day 16: Namche Bazaar - Lukla (2800 m). We descend through the forest and continue along the Dudh Koshi banks. A short climb takes us to Lukla. Day 17: Lukla - Kathmandu by plane.